With these projects, fake grass can be real fun. What could you do if you let your creativity shine? Outdoors or in, our turf’s bright color and easy care make it a great material for design. Whether it’s a large roll or just a few scraps, Watersavers Turf has your supplies covered. Fake lawn has big possibilities; check out these DIY-worthy ideas! Upgrade your yard with a creative twist. Because it’s so easy to shape, cut, and place, you can do things with fake grass installation that you’d never try with traditional sod! How can you transform your landscape? Try one of these ideas! Writing on the Wall. Cut scraps of fake grass into the shapes of numbers and letters, and tack a message onto your fence. Write your family name or street number. Get creative and add an inspiring word like “Love” or “Play.” Wall features are a big trend, so go big and go bold. Just for Kids. Add a fake lawn installation to your yard for a kids-only play area. It’s safe to run, walk, or crawl on and won’t leave dirt on hands or stains on clothes, so it’s ideal for youngsters. Pick a neat shape, like a diamond or zig-zag, and make it a zone just for toys and games. Level up the fun with a climbing structure or trampoline. Install block seats right under the turf so there are built-in chairs sized just right for tiny folks. Our live grass substitute can go vertical with ease, so it wraps up and around the seating with a great, consistent look. Micro Golf. Build a fun miniature golf course to practice your putt. Add yard toys, like gnomes, for a classic touch and try to swerve the ball around them. Or, build your own obstacles to keep golfers on their toes! Different sized cardboard boxes and some bright paints are all you need to whip up a tricky course of your own. Once your landscaping is game worthy, family and friends will be lining up to try for a birdie. There’s more to artificial turf than yards. 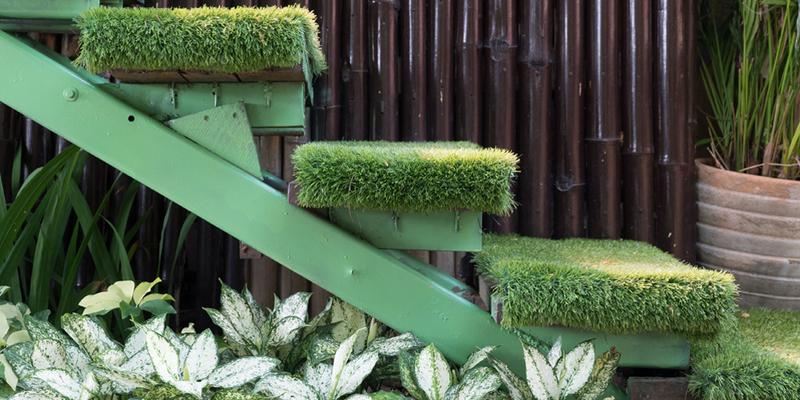 With a little creativity and some remnants of fake lawn, you can add a bright twist of whimsy to the indoors too! Table Runner. Set your table for smiles with a playful table runner! Run a strip of our product down the center of your table and decorate with small goodies from a toy or craft store. Scatter plastic flowers across it for a bright touch of color and every meal will feel like a picnic. Or, add a few novelty toy footballs for a sports-themed party and kick off the fun. Wallpaper. Give a room an edgy designer pop with a bold wall decked in one of our 60+ varieties. Trade your simple paint job for a nice statement wall of artificial grass from floor to ceiling. The material has a mod 1960s feel with a whimsical touch of the outdoors. All you need to do is staple or nail it directly over plaster or drywall. It’s easy to try for just a few days or weeks as a seasonal statement, but once you see the refreshing look, you might want to keep it for years! Upholstery. Grab a vintage chair at a flea market and give it a little TLC. Swap out the tired fabric and replace it with scraps of faux lawn for a fresh twist. Choose the highest quality turf you can get and enjoy a plush cushion right out of Wonderland. The lighthearted vibe is great for a teen’s room; these seats are extra fun near big windows or sliding glass doors as transition pieces that bridge your interior design scheme and your yard.